One level Villa for sale on a flat plot with wheelchair access. 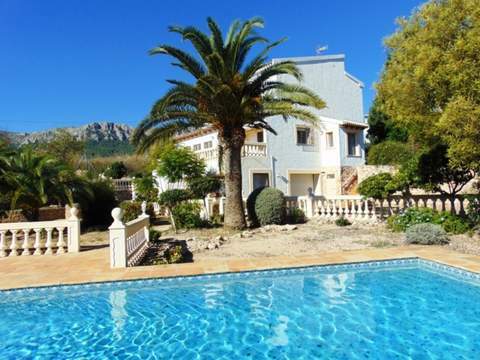 The property consists of entrance hall leading to three double bedrooms and one single. Two bedrooms share a family bathroom. The master has an en-suite walk-in shower and walk-in wardrobe. Lounge flows into the open plan dining and fully fitted kitchen. Large windows allowing views over the garden towards the pool. Double doors out to a covered Naya, BBQ and access to the garage. Plenty of parking on the drive at the front of the property. The garden is surrounded by mature trees and plants allowing privacy in the pool and garden.